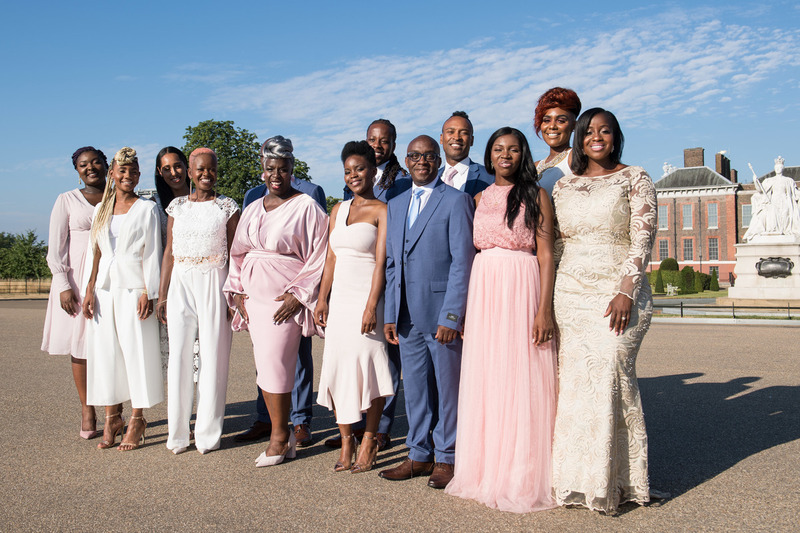 After Royal Wedding Spotlight, The Kingdom Choir Releases Debut Album Their performance at the wedding of Prince Harry and Meghan Markle catapulted The Kingdom Choir into the international spotlight. Now, they're out with their debut album Stand By Me. Following their performance at the Royal Wedding of Prince Harry to Meghan Markle, The Kingdom Choir, conducted by Karen Gibson, signed a record deal with Sony Music. Their first album, Stand By Me, is out now. If you were one of the millions of people around the world who watched the wedding of Prince Harry and Meghan Markle earlier this year, chances are you remember the gospel choir. The Kingdom Choir, which is based in London, captivated audiences from around the world with their performance. When they left the chapel that day, crowds called out to the members, trying to take selfies, offering a very different experience than hours before when they entered, says choir conductor Karen Gibson. "It felt almost like we were being mobbed and being treated like celebrities and I was like, 'Whoa, what is this?' and then of course Facebook went mad as did Instagram," Gibson says. "I think that's when I got a bit of a hint at what was going on." The group recently released its debut album, Stand By Me, that features renditions of top hits from John Legend, Beyoncé and Coldplay, as well as gospel classics that include "Amazing Grace" and "Hark! The Herald Angels Sing." Prior to this royal wedding, the group had performed for many other notable individuals, including Queen Elizabeth II, Bill Clinton, Desmond Tutu and Nelson Mandela. Gibson says she thinks this particular event struck a chord because it was a wedding. "Everybody loves a good wedding," she says, especially when "two very special people" were involved. "I particularly have a soft spot for Harry — and then there's Meghan who is of mixed heritage," Gibson says. "Then there was the fact that this wedding passed by some of the usual traditions." Gibson says she doesn't recall a black gospel choir performing at a royal wedding. The group's performance and the sermon given by Bishop Michael Curry made the ceremony particularly inclusive, she says. But all throughout Britain — and Europe more broadly — the gospel community is thriving, says Gibson. "Before I was a signed artist, I was up and down Europe ... teaching gospel music workshops nearly every weekend in places like France, Belgium, Spain, Italy, Poland, Sweden, Denmark, The Czech Republic, Latvia, it just goes on and on," Gibson says. "Gospel music I think is very much alive and well." One of the songs the choir decided to include on its debut album is "Something Inside So Strong" by Labi Siffre. The song is known and loved by many, but mainly as an anti-apartheid anthem. Regardless of how people know the song, Gibson says it has a resounding message for all. "I feel that the song speaks of an inner strength. It speaks of resilience. It speaks of hope. It speaks of identity and knowing yourself," Gibson says. "That despite what troubles come your way, despite the things that will come to knock you down or make you feel low, actually if you reach deep down, you can find hope for tomorrow." Gibson says it's important that people learn this resilience and "have that understanding that whatever's going on, joy comes in the morning. There's always a brighter day tomorrow. Always." "Something Inside So Strong" is just one of many songs that provide a mix of anthems, gospel classics and pop. "We wanted songs that people could connect to, but actually, I kind of think that some of the differences that we put between the secular and the sacred sometimes, you can find the sacred in what we see as the secular," Gibson says. "When I hear the song 'Make You Feel My Love,' that speaks of God's love to me, do ya know?" Gibson says feedback has already been pouring in from fans. "They're talking about washing up the dishes and bursting into tears, or you know, having real, great spiritual moments," Gibson says. "Hearing these songs that we say our pop and we want to maybe put them on that side because they belong to the pop world. But actually, if you listen to the lyrics, some of them, you know, I think you can have great experiences with them." Though The Kingdom Choir is receiving a warm reception, its album comes at a time of heightening racial tension in the world and in England. When it became clear that Meghan Markle and Prince Harry were dating, Markle received racist hostility directed at her, so much so that the palace had to speak about it. Gibson says she sees the embrace of the album as an expression of listeners' desire to embrace inclusion, diversity and love. "I think that it means that people want to hear good music," Gibson says. "I think that it means that people are tired of the ugliness and that they're embracing something that brings hope." NPR's Gemma Watters and Martha Wexler produced and edited the audio for this story. Wynne Davis adapted it for the Web.